The HTC Desire 12 Dual-SIM Smartphone combines eye-catching style with best-in-class performance. It is big to see and smart to hold. 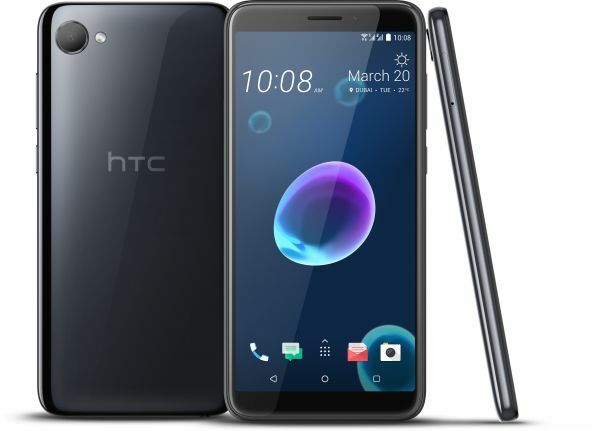 The beauty of this HTC smartphone is exhibited by its modern and sleek design. Also, the cool black finish gives it a premium look. The 5.5inch screen of this phone gives you a mesmerizing visual experience. It is big enough to enjoy movies and TV shows on the go. Furthermore, the 13MP rear camera is equipped with a variety of advanced features that allow you to capture artistic photos with every shot. This HTC mobile has a 5MP front camera that delivers gorgeous selfies even in low light settings. You can keep this phone filled with all your special moments, thanks to its 32GB inbuilt storage that gives you the freedom to click numerous photos without running out of space. Moreover, the smart capabilities of HTC Sense Companion make your daily life easy and fun. The HTC Desire 12 is armed with a MediaTek MT6739 Quad-Core processor that runs all the high-end functions with streamlined efficiency. The 3GB RAM provides fast responsiveness, which is ideal for smooth multitasking. This sleek smartphone is preinstalled with Android Oreo operating system that provides fast boot-up speeds and advanced power saving features. The HTC Desire 12 has a streamlined look that never fails to impress. It has beautifully curved edges and a seamless frame that give you a luxurious feel. Its compact size and lightweight design let you operate with one hand comfortably. This phone has a big 5.5inch screen that is easy to handle, thanks to its slender frame. This HTC dual-SIM phone has a 5.5inch screen that offers stunning clarity to immerse you in your favorite content. The 18:9 aspect ratio of the 5.5.inch screen gives you a better and bigger viewing experience. The screen has IPS technology that provides a wide angle of view, so you can enjoy movies and TV shows along with your friends and family even when viewing from extreme angles. This HTC mobile has a 13MP rear camera that captures all your special moments with stunning clarity. The phase detection autofocus feature ensures clear details even if you are capturing a moving subject. Furthermore, the rear camera features a BSI sensor that ensures outstanding lowlight photography. The phone has a Video Pic feature that lets you capture a photo while shooting a 1080p video. The 5MP front-facing camera gives you awe-inspiring selfies any time of the day. The MediaTek MT6739 Quad-Core processor of this HTC smartphone offers outstanding speed and efficiency to make everything from web browsing to photography smooth and flawless. The 3GB RAM allows you to use multiple applications and web tabs at the same time. The preinstalled Android Oreo that offers various innovative features to make your smartphone experience fun and simple. The HTC Sense Companion reminds you of holidays or upcoming events, so you are always ready for everything. Also, it can turn off alarms during holidays so that you can sleep peacefully. During the busy days when you are in too much hurry, and you forget to charge your phone, the HTC Sense Companion reminds you to charge or bring a power bank. Lastly, the HTC Sense Companion makes sure that your smartphone is running at its optimum speed. It suggests clearing unused apps and junk files for free space. This is good gadget in this price range. Working is very fine. support every application and battery backup is also up to point. Overall good product. Nothing. I do not face any issue with this device until now.